For a start, let me explain why I decided to work on a project like this. Well... at first sight, the whole thing doesn't seem really important at all. I had that in mind when I started working on it that it's not going to be something that makes people freeze in amazement when they see it. The thing is that sometimes it's important for a designer to withdraw his own aesthetic preferences, throw away all these glittering and shiny effects and go into pure information design with no icing on top of the cake. Why design a document, then? 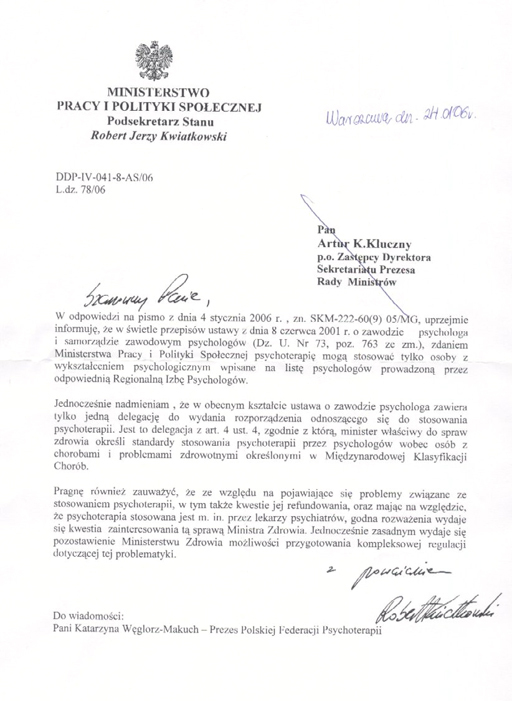 Take a quick look how the documents in Poland look like. Is there any reason to redesign them? Would you actually care to read them? Well, if it's just two or three pages, you probably will. But what if it was, say, 150 pages long? Would you still read it? I probably wouldn't. And it's not because they're not important. These are the acts regulating the laws of the country, so they are extremely important. But they don't look user-friendly. They look as if the effort needed to actually read them is so enormous that a regular person instantly goes braindead. Considering the amount of information people have to process every single day, there's simply not enough time to actually sit still and read it. The other thing is the gargantuan anount of legal jargon inside the text that makes you wonder if these were really made to help people. Let's get back to basics, then. I started my work from figuring out what a system was. I won't be giving the definitions here, so if you'd like to read more about systems, you can do it here. Generally speaking, a system is a set of the components that work together as a whole. Knowing that, I tried to figure out what a document is*. The funny thing is that the word itself comes from the Latin docere, meaning "to teach". That really made me wonder if it would be possible to create a structure that would help teach the user how to use it. What was my design approach, then? The first step was choosing the right paper size. The obvious choice was A4 format for its standarized dimensions and popularity in Europe. As you can see in the picture above, I started from thinking about the usage of the printed documents. What's the way the paper could be folded? What are the areas that would be print-safe so that no information would be lost when printing with different printers? At the same time, I started thinking of possible future uses – I wanted it to be possible to generate the files using a system connected to a database. Why? Well, the main reason was to minimize a possibility of making a mistake by accidentally removing an important part of information when using Word templates. It was also essential to have one text in the database that would be the only data the lawyers or office workers have to edit when needed. Above, you can see the examples of the documents that were generated using the same grid (you can read about the grid here), but using different type of data. 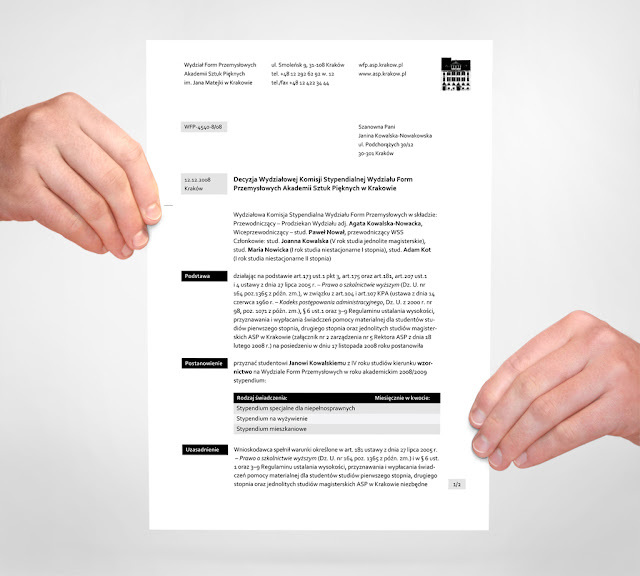 From left to right: a testimonial, an administrative decision, an administrative decision with a table, student registration form, an announcement). I could go on like this for much longer, but I've just realized how big this post has become, so let's close on the subject for now. The following posts will focus more on particular design solutions, but I think this gives you an idea on the possibilities and solutions. If you managed to get there through these massive amounts of text, congratulations! I hope you'll find my thoughts useful for your own design research. If you have questions or comments, feel free to do so. And again, thank you for reading and see you in the next post! *the word document has many meanings, but for this post, let's consider it as a writ or a regulatory act in a written or printed form. Stumbled on your blog as recommended by google. Pretty cool info,and nice format. Sorry header didn't come out right, should be like this without the lines.. Thanks for the comment, you got me really curious. 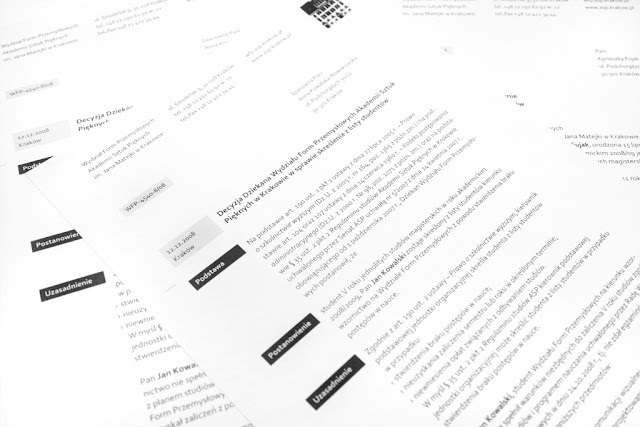 Could you tell me where I can find the info on the rules you have to follow when designing a document? I did research on that and, apart from the type of data that has to be on the document depending to its purpose, I couldn't find anything on *where* these have to be put. Hi Kamil, sorry for my late reply I only now got time to check back here. I would suggest you go to you're local library and look up some books about text / word processing. That's what we used in business collage and there you will find all the different formats that should be in use. You might want to check out google books too, they have several books there for online reading. However I suspect the books google have there are mostly from USA.. Anyways it's someting for you to check out. I actually was trying to read the documents. Interesting. Keep up the good work! 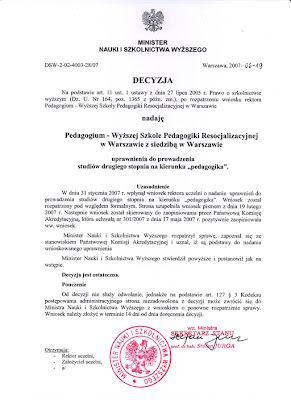 niestety administracyjne dokumenty maja na celu być nieprzystępne dla petenta,a wymogi do stworzenia tego dokumentu są zabijające logikę i czytelność. 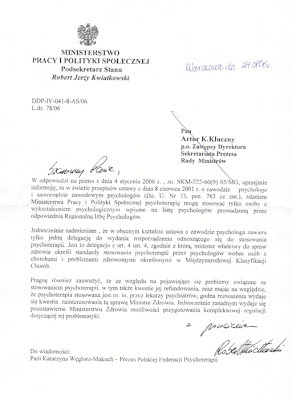 przykład: zus, krus, skarbówka, unijne to tak na dzień dobry. 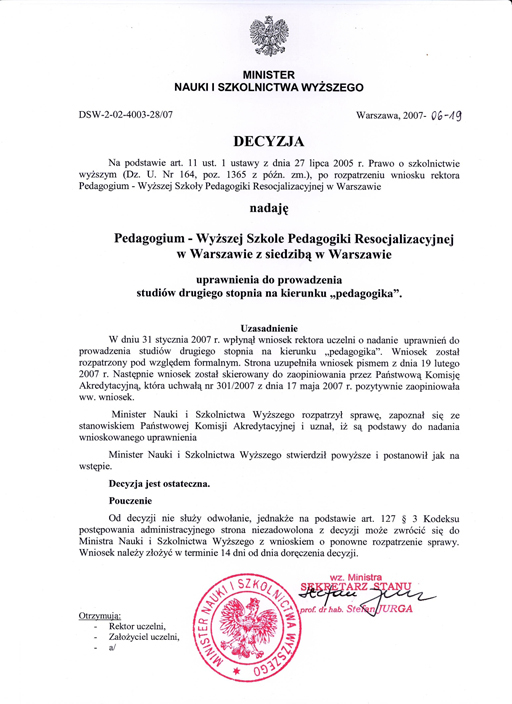 Nie baez powodu petent ma czas na odpowiedź około 7 do 14 dni a urzędy do około 30. Nice. Can I download the examples of the documents? Where can i find examples of the documents? They aren't available for download here. Please send me an e-mail to the address you'll find in my profile. The document is so interesting to me as I was looking for such type of document. Thanks for nice post ! Very good designed blog. Fantastic! I have never seen blogger blog design like this before. thanks for detailed post about designing a system of documents...!! !